Government generally served the interests of the fishery before 1729. Beginning in the 18th century there existed parallel systems of governance. Although explored in the 16th century and settled partially in the 17th, Newfoundland did not acquire a governor and civil magistrates until 1729. 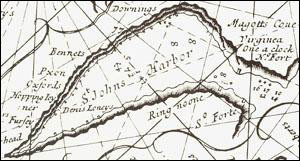 The absence of an appointed governor made early Newfoundland distinct from the New England colonies, but this did not necessarily mean that the island existed in a state of anarchy or, as popular imagination has it, as a fiefdom of despotic fishing admirals and harsh quarter–deck justice. In the absence a governor in St. John's, several overlapping authorities and jurisdictions administered the law and government needed by the people living on the island and working in the fishery. An inset from the English Pilot of 1689. The larger and detailed versions of this image show that the town was being used by both residents and migratory fishermen. Courtesy of the Centre for Newfoundland Studies, Memorial University of Newfoundland, St. John's, NL. From John Thornton, A New Chart of the Trading Part of New Found Land (London: Thornton, 1689). Composed of both legal and popular institutions and practices, government in pre–1729 Newfoundland principally served the interests of the fishery. The relatively slow development of government institutions was in large part a natural product of Britain's policy toward Newfoundland and the structure of the fishery. Generally speaking, the island was not a colony in the traditional sense but, rather, a seasonal fishing station for the sole use of the English fishery. On the one hand, because of the relative absence of a substantial settled population, there were not sufficient pressures for local government until the first quarter of the 18th century. On the other, the British government supported the mercantile interests and worked to ensure that the Newfoundland fishery remained an essentially English venture. While some year–round settlement was inevitable and indeed necessary for the operation of the migratory fishery, formal government institutions were not:	British officials remained skeptical about granting Newfoundland its own legislature right up to the eve of representative government in 1832. The passage of the first Western Charter in 1634 formalized the system of customary laws which had governed the West Country fishery. The Charter basically codified a series of regulations concerning various offences, such as theft and drunkenness, that interfered with fishing operations. It established the system of fishing admirals and gave them the power to judge all local disputes and crimes except felonies, which had to be heard in England after the ships had returned in the fall. The 1699 Act, known as King William's Act, formed the basis of the island's written law until the late 18th century. It gave the fishing admirals statutory authority over the administration of justice in the fishery and authorized the practice whereby commanders of naval warships stationed at Newfoundland acted as appeal judges. By establishing in law the roles of both the fishing admirals and the Royal Navy, King William's Act set the stage for the entrenchment of naval government in Newfoundland. Beginning in the 18th century there existed in Newfoundland parallel systems of governance. The island had effectively dual authority: the laws and regulations of the colonists, and the Western Charter of the fishery. This cleavage continued in the 18th century with the divisions between naval commanders and fishing admirals, of whom the naval officers were invariably critical and derisive.